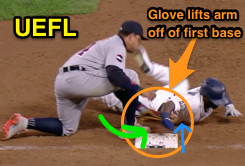 First baseman Miguel Cabrera pushed baserunner Guillermo Heredia off of the first base bag on a challenged play ruled not reviewable by the New York Replay Operations Center. The Play: With one out and one on (R1) in the 9th inning of a tied ballgame, Tigers pitcher Warwick Saupold attempted to pick off Mariners baserunner R1 Heredia. Replays indicate that after Heredia dove back into first base, his right hand making contact with and holding the base as Cabrera received the throw, Cabrera's tag lifted up Heredia's arm and caused him to momentarily break contact with the base, during which Cabrera tagged Heredia while he was off of his base. Cabrera's glove lifts Heredia's arm off first. The Call: 1B Umpire Mark Carlson ruled Heredia safe at first base based on an interpretation of Official Baseball Rule 5.06(a)(1) ["A runner acquires the right to an unoccupied base when he touches it before he is out. 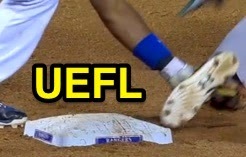 He is then entitled to it until he is put out, or forced to vacate it for another runner legally entitled to that base"] that supersedes 5.09(b)(4), which states that a runner is out when "He is tagged, when the ball is alive, while off his base." The Interpretation of OBR 5.06(a)(1) holds that, "if in the judgment of an umpire, a runner is pushed or forced off a base by a fielder, intentionally or unintentionally, at which the runner would have otherwise been called safe, the umpire has the authority and discretion under the circumstances to return the runner to the base he was forced off following the conclusion of the play." The History (Pre-Replay): In Game 2 of the 1991 World Series, Twins first baseman Kent Hrbek tagged out Braves batter-runner Ron Gant on a disputed pushed-off no-call, 1B Umpire Drew Coble ruling that Gant overslid the base and was not forcibly pushed off of his legally occupied base. Fletcher's out call prevailed after a non-review. The History (Replay Era): On May 1, 2015, 2B Umpire Andy Fletcher ruled A's baserunner Mark Canha out on an attempted steal of second base. After A's Manager Bob Melvin argued that Rangers shortstop had pushed Canha off of the base, Fletcher and Crew Chief Jerry Meals consulted with New York's Replay Operations Center and deemed the play unreviewable; like Coble in '91, Fletcher's out call prevailed, as did his judgment that the fielder did not force the runner off base. The Final Disposition: As it did in 2015, MLB's Replay Operations Center ruled the Cabrera/Heredia play unreviewable, and Carlson's judgment call that Cabrera pushed Heredia off of his legally held base triumphed; the runner was safe. Said Tigers Manager Brad Ausmus, who had attempted to challenge the play: "I knew I couldn’t challenge whether the runner was knocked off the base or not. I was challenging the call. They never indicated that Miggy had knocked him off." As for why Carlson and Crew Chief Fieldin Culbreth consulted with the Replay Operations Center: "Maybe they were unaware it was not challengeable. Maybe they just wanted to double-check it with New York."